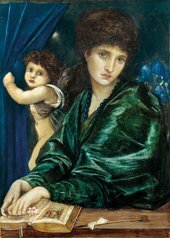 Combining rebellion, beauty, scientific precision and imaginative grandeur, the Pre-Raphaelites constitute Britain’s first modern art movement. 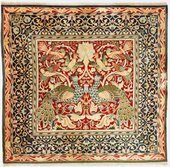 This exhibition brings together over 150 works in different media, including painting, sculpture, photography and the applied arts, revealing the Pre-Raphaelites to be advanced in their approach to every genre. 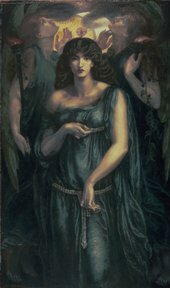 Led by Dante Gabriel Rossetti, William Holman Hunt and John Everett Millais, the Pre-Raphaelite Brotherhood (PRB) rebelled against the art establishment of the mid-nineteenth century, taking inspiration from early Renaissance painting. The exhibition establishes the PRB as an early example of the avant-garde: painters who self-consciously overturned orthodoxy and established a new benchmark for modern painting and design. 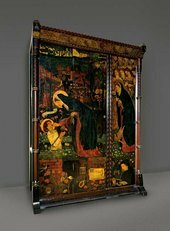 It will include many famous Pre-Raphaelite works, and will also re-introduce some rarely seen masterpieces including Ford Madox Brown’s polemical Work 1852–65 and the 1858 wardrobe designed by Philip Webb and painted by Edward Burne-Jones on the theme of The Prioress’s Tale. 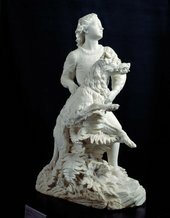 You’ll also see John Everett Millais’s first painting ‘en plein air’ entitled: Ferdinand Lured by Ariel 1849-50 and the politically charged: A Huguenot, on St Bartholomew’s Day, refusing to shield himself from danger by wearing the Roman Catholic Badge 1851-2. 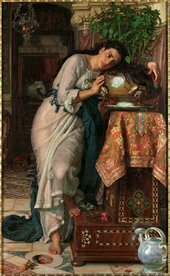 The exhibition shows that the Pre-Raphaelite environment was widely encompassing in its reach across the fine and decorative arts, in response to a fast-changing religious and political backdrop, and in its relationship to women practitioners. I went...highly recommend it....cried my eyes out too...love Rossetti....The Beloved took my breath away! It is amazing! Anyone who hasn't seen #PreRaphs must go check it out. Beauty, extraordinary beauty & skill. For of the best hours of my life! Visited the Pre-Raphs at Tate in 2012. Awesome! 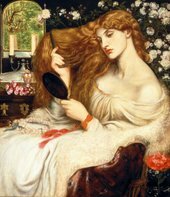 Part of the Pre-Raphaelites exhibition event programme, this talk explores the special connection between Pre-Raphaelite art and fashion. Teachers' pack to accompany the Millais exhibition at Tate Britain, including full colour A4 images, introductory information, discussion points.